If there is one area where technology has outpaced regulation in London - and in many other major cities - it has been the rapidly changing taxi and private hire market. Successive mayors have tried to get the legislation to cap the increasing number of minicabs, driven in part by apps like Uber. So far they have failed which has meant that Transport for London (TfL) has to issue Private Hire Vehicle (PHV) licences if the drivers meet the requirements. Currently, there are 118,000 licensed private hire drivers who have been blamed for congestion, pollution and an increase in collisions. If you look at the regulation around this market, you can see where it has been outpaced. It is only now that more compliance officers are being recruited, and soon there will be 350 officers to police 139,000 vehicles. Previously there were 82 officers. To pay for that, TfL is having to introduce large fees for minicab operators, some will be millions of pounds. Helen Chapman, general manager of taxi and private hire at TfL, said: "The operator fees system is no longer fit for purpose. "It is only fair that licence fees for private hire operators accurately reflect the costs of enforcement and regulating the trade. "The changes to fees would also enable us to fund additional compliance officers to help crackdown on illegal and dangerous activity." Even basic data gathering such as the number of collisions and occupants injured in taxis and private hire vehicles isn't split between the two trades. Although that is now changing, the existing data gives an interesting picture. Between 2013 and 2015 the number of passengers injured in taxis and minicabs went up from 544 to 827 - an increase of 52%. The corresponding figures for black cabs shows they have remained static at about 21,000 over that period but the number of PHVs went up 54% from 65,656 to 101,434. There are now calls from the Liberal Democrats on the London Assembly for drivers to be banned from using what they think is causing the problem: apps while driving. Black cab organisations like the London Cab Drivers Club would also like to see them restricted and they also want much clearer guidance from the Met Police and TfL about when they can be used. At the moment, TfL says it is up to the individual drivers to make sure they are driving safely. 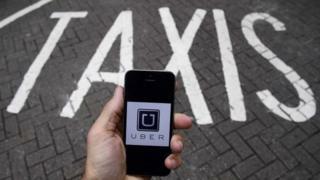 An Uber spokesperson said: "It is against the law to hold a mobile phone or device in your hand while driving. Drivers must be in proper control of their vehicle and concentrating on the road at all times." In the middle of a rapidly changing world, it is TfL whose old systems cannot cope with the changing landscape.